As part of the To Be Number One project, a nationwide cheerleader contest is planned to encourage teenagers to exercise and get away from drugs. Cheerleader Thailand Championship 2003 will take place all over the country. The first stage of the contest will take place in Nakhon Ratchasima August 9-10, and the second stage in Chiang Mai Central at Airport Plaza August 16-17 at the Lanna Hall. Judges will also select representatives in the southern and central regions and all regional winners will be on stage for the final on October 18 in Chiang Mai. 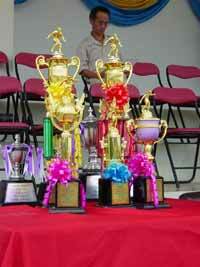 The competition has been held for the last three years and is a success with many teenage participants. This year’s event is a collaboration between the Public Health Ministry’s Mental Health Department, Office of Narcotics Control Board, Central Airport Plaza Chiang Mai and Mac Media Company. There are two categories, high school teams and the college teams, and more than 80 teams from schools and colleges all over country are hoping to win HM the Queen’s Cup. 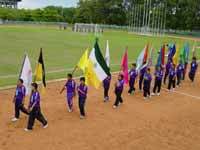 The 20th National Youth Games of Region 5 have been organized and will be held from October 18-27 in Nan Province. The games will be used as the basis to select the best athletes from the region to compete at the National Youth Games in Sukhothai Province next year. Nan Province’s preparations are well underway, according to Charoensook Coumsri, Nan deputy governor who chaired a meeting on July 17 covering the preparations for the competition this year. 24 types of sporting competitions will be included in the games: athletics, badminton, basketball, international boxing, amateur boxing, bicycle competition, ballroom dance, football, golf, gymnastics, handball, judo, lawn tennis, rugby football, amateur Thai boxing, petanque, swimming, table tennis, taekwondo, sepak takraw, volleyball, weightlifting, wrestling, shooting, and snooker. 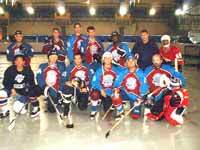 A group of Chiang Mai residents, mixed Thai and farangs, play ice hockey every week - exactly what everybody imagines doing when living in a hot country like Thailand. The boys on blades train twice a week, every Friday evening from 21.00 - 23.00 and every Sunday morning from 8.00 - 10.00. So, there’s no excuse for anybody to not pass the puck, as there is one timeslot for the night owls and another for the early birds. Eight teams from Chiang Mai University, Mae Jo University, Payap University, Yonok University in Lampang, Rajabhat Institute of Chiang Mai, Mae Hong Son Provincial Division 2 team, Lamphun Provincial Electricity Authority team and PT Sports team are vying for the latest football trophy. The first match was a hard fought battle between CMU and Yonok University. This competition is to help sportsmen ready themselves for the upcoming the 31st Thong Kwao Games to be hosted by CMU at the beginning of next year. The official opening ceremony was presided over by Assist Prof Dr Tanun Anumanrajadhon, vice president for international relations and special affairs, at the CMU main stadium on July 21. 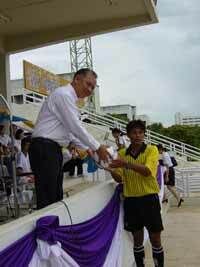 Assist Prof Tanun Anumanrajadhon, vice president for international relations and special affairs, hands over the official ball to start the matches rolling. Matches will take place every day until the final on July 30. Asst Prof Manoon Sutika, the advisor to CMU football club, said it is hoped that the competition would give the sportsmen more experience and they would realize their strengths and weaknesses after the event. 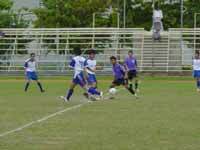 The first match was between Chiang Mai University and Yonok University and was started by Assist Prof Dr Tanun Anumanrajadhon. First prize in the CMU Cup competition is 10,000 baht cash and the trophy, and the 1st runner-up, 2nd runner-up and 3rd runner-up receive 5,000 baht, 3,000 baht and 2,000 baht respectively. Here is your host team from CMU. Who’s name will be on these trophies? The parade of team flags marches into the stadium.